A growth and innovation strategist with a rich resume of brand launch experience for Fortune 1000 companies, Emmons has spent decades consulting clients ranging from major corporations to Silicon Valley startups in diverse sectors including health care, CPG, financial services and telecommunications, in addition to many more. His holistic business perspective integrates market understanding with corporate capabilities to ensure multi-channel solutions that are sophisticated, yet practical. As a longtime executive at Bristol-Meyers Squibb, Humana, and Blue Cross Blue Shield of Florida, and former Plan B client, Emmons brings this wealth of precision thinking to Plan B, incorporating a depth of knowledge and understanding of the tech sector and digital realm that’s rare among his generation. His digital street cred includes being lauded by the techies and coders who built Mint.com, as Emmons’ strategic business insights were critical to the platform’s success in a crowded marketplace. As a pilot, a diver, a sailor and a former adjunct professor at the University of Evansville, he truly is a Renaissance man. 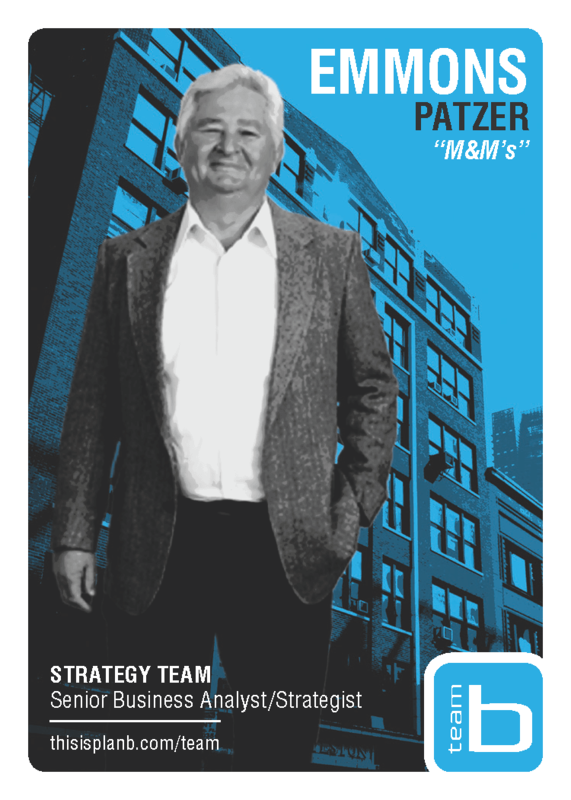 And, most importantly, as a business-first marketer with a mind as sharp as they come, he’s an invaluable asset for our agency.